Besides bordering the Pacific Ocean, the east coast of Eurasia and the west coast of North America have something in common. They are part of the Pacific Ring of Fire. According to plate tectonic theory, the massive Pacific Plate slowly slides below neighboring plates and rock layers sink into our planet’s super-hot interior. As those rock layers melt, magma travels upward, fueling volcanoes. Consequences of this process are especially evident on the Kamchatka Peninsula, in the far eastern Russian Federation. 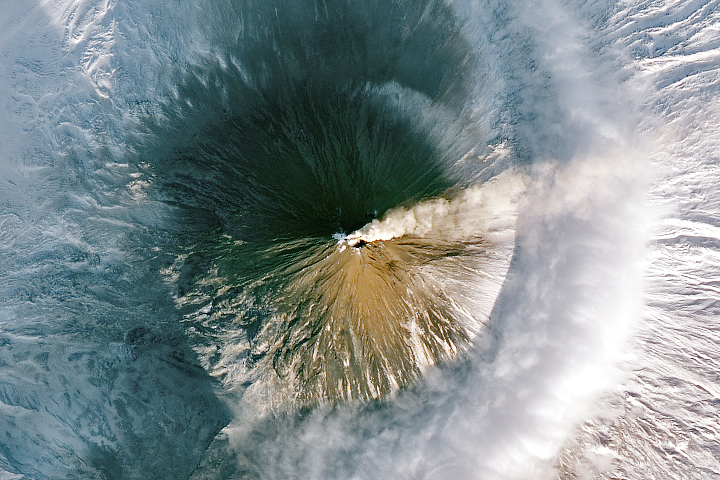 The Kamchatka Peninsula sports nearly 70 active volcanoes, although most of them appear calm in this scene. 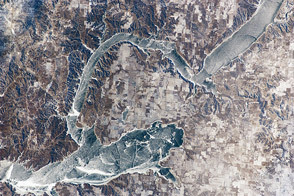 The Moderate Resolution Imaging Spectroradiometer (MODIS) on NASA’s Aqua satellite captured this natural-color image on December 19, 2011. Snow blankets most of the peninsula, but the relatively dark area likely results from that area’s lower elevation and resulting lighter snow cover. 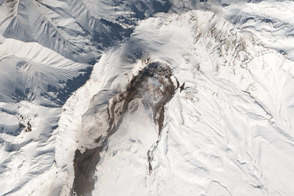 Acquired two days shy of the winter solstice, this scene shows low-angled sunlight that causes several volcanoes to cast long shadows to the north. 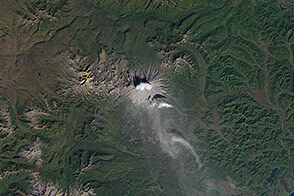 Many of the volcanoes on Kamchatka are stratovolcanoes—tall, steep-sloped, and conical. Klyuchevskaya (also Kliuchevskoi) is the tallest, rising to 4,835 meters (15,863 feet). 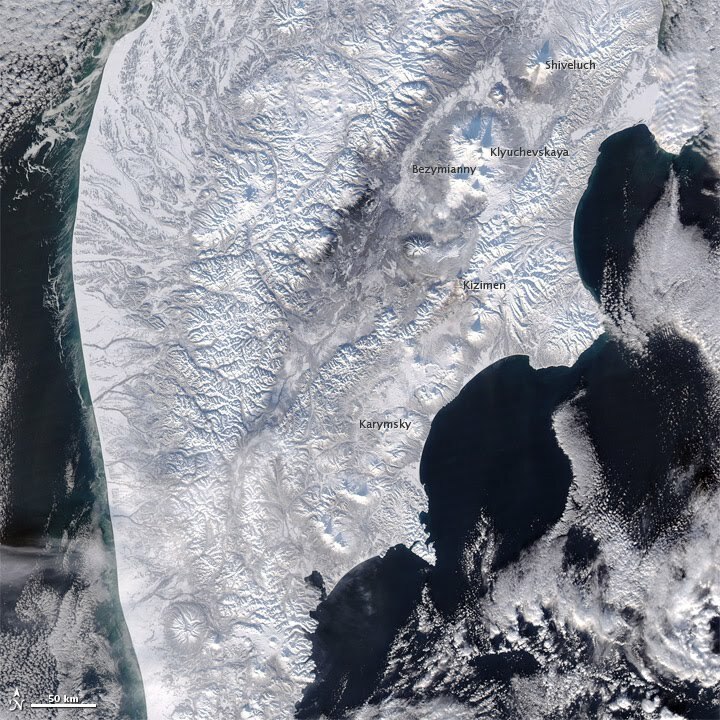 Klyuchevskaya is generally regarded as Kamchatka’s most active volcano, but Bezymianny, Kizimen, Karymsky, and Shiveluch all remain active. 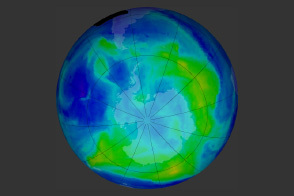 In this image, Shiveluch emits a discernible plume that blows toward the south-southwest. 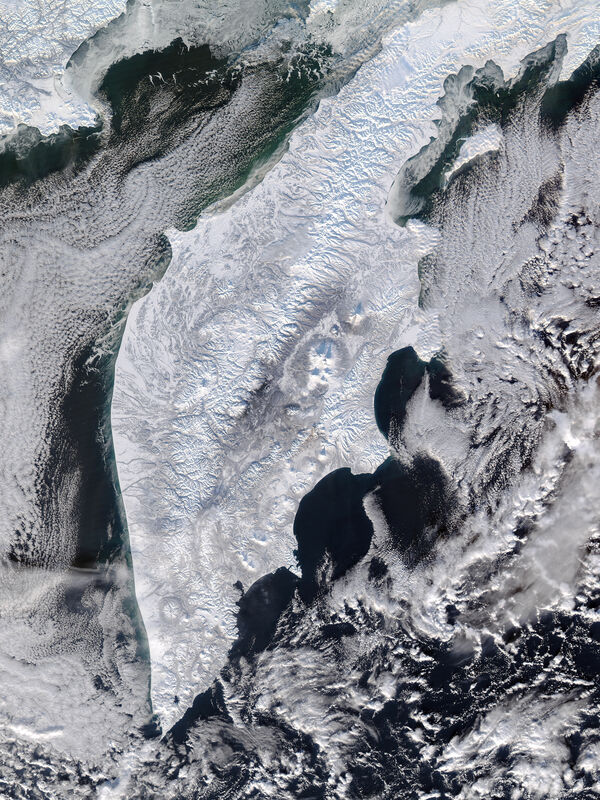 Most of Kamchatka’s volcanoes appear quiet in this snowy scene from December 2011. Global Volcanism Program. Bezymianny, Karymsky, Kizimen, Shiveluch, Kliuchevskoi, and Shiveluch. Smithsonian Institution. Accessed February 23, 2012. Kamchatka: Siberia’s Forbidden Wilderness. The Ring of Fire. PBS. Accessed February 23, 2012.